Course Description: You will learn how to deal with models that exhibit large displacements and/or yielding, discuss and practice the use of many material models available in SOLIDWORKSSimuation Premium and, most importantly, how to drive a non-linear analysis to successful completion. The second part of the course will expose you to various advanced topics in Dynamics. The material covered includes the time dependent analysis, harmonic analysis and random vibrations. 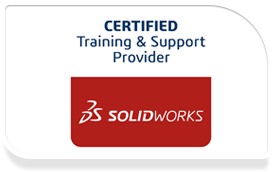 Prerequisites: Must have attended the basic SOLIDWORKS Simulation class, or must have an experience with SOLIDWORKS + working basic knowledge of finite elements and of basic mechanical principles. The knowledge of basic principles in Vibrations is strongly recommended, but not required. Who should attend: Designed for users who would like to become productive fast, the nonlinear course offers hands-on experience on the use of SOLIDWORKS Simulation nonlinear module. The four-day course provides an overview on a wide range of nonlinear structural/mechanical and dynamic analysis topics. 3D nonlinear gap/contact analysis (with or without material nonlinearities).